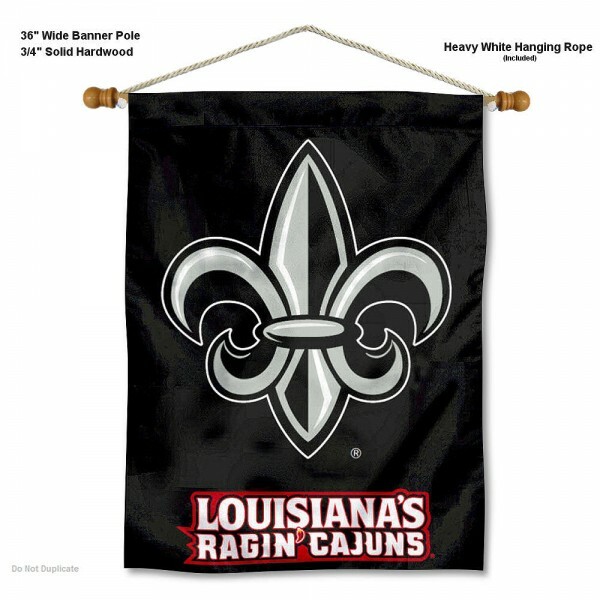 This Louisiana Lafayette Rajun Cajuns Wall Hanging includes a 36" wide banner pole which is made of 3/4" solid hardwood and has a thick hanging rope. The banner measures a large 30 x 40 inches, is made of polyester, and has screen printed logos which are viewable from both sides with the opposite side being a reverse image. This wall banner can be used indoors or outdoors and be hung on any wall or door to display your team spirit. In addition, this item is Officially Licensed by the University of Louisiana at Lafayette which ensures current insignias and authentic colors.